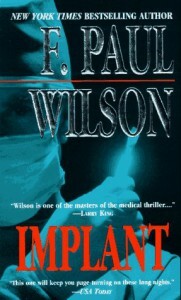 The medical thriller meets DEATHWISH in this fast paced offering from F. Paul Wilson, as a plastic surgeon wages a personal vendetta against politicians determined to change healthcare in this country, potentially for the worst. But are his motives really that crystal clear? Originally published in 1995, this prescient novel foresaw the coming of government interference in healthcare, and remains timely to this day. A must-read for anyone who enjoys a solid, intelligent thriller by one of the best in the business.